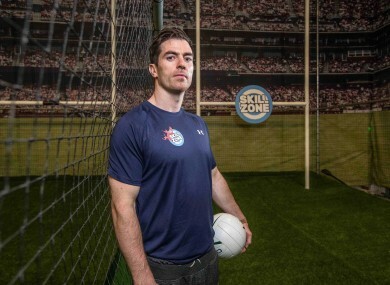 The midfielder talks about the shift towards strength and conditioning in GAA. Macauley has recently returned to basketball. MICHAEL DARRAGH MACAULEY loves an analogy. He’s referring to the shift of emphasis in the gym. The shift of emphasis towards power rather than size. The Dublin midfielder recalls a time, under the management of Paul Caffrey, when gym programmes revolved around hitting the weights hard. “I remember I had just started training with the Ballyboden senior team and Collie Moran and Conal Keaney were on that team at the time and they came back and they had doubled in size and they were swatting lads away,” Macauley said. Macauley is a natural athlete. He has recently returned to basketball with his local club, Eanna, and is constantly on the lookout for new methods to improve and maintain his fitness. While he works closely with Dublin’s strength and conditioning coach, Bryan Cullen, and indeed Daniel Davey on nutrition, Macauley also teaches and practices yoga as a form of recovery. “I am always looking for something different, like always trying the latest fitness thing, the latest weights thing, I am always trying something different. “This is championship end of the season, when you want to be firing on all cylinders, so working with him [Cullen], on an explosive weights programme and stuff. “I went back playing basketball as well, which was a huge thing, to be honest. I managed to get back for a few weeks, and felt so fresh afterwards. It was mostly short sprints. And really enjoyed it. It’s arguably Dublin’s meticulous work off the field which contributes to their unprecedented success on it. Developing strength and power is the primary focus, as is preventing injury. “I’d always be doing something,” the 29-year-old continues. “I’d have my week pretty meticulously planned. I’ll have session A and B here with Dublin and then I’ll have X and Y but I won’t be running a mountain. “It’s nothing stupid and I talk it through with Bryan as well in terms of where I’m planning Yoga sessions. Planning is a huge thing with lads because we don’t have the joys of being off or whatever and if you have to get up at six o’clock you have to get up at six o’clock and get work done. With the Dubs’ championship opener, against Laois, just around the corner, it’s crunch time for Macauley and his team-mates. A winter of hard work, and a successful league campaign, have laid the foundations for their All-Ireland title defence. “We don’t do a lot of early morning sessions so it’s up to the player,” he explains. “On a personal level I much prefer doing them, I’ll get up and teach a yoga class or whatever early in the morning. Skill Zone, Dublin’s first and only multi-sport indoor attraction, is now open for booking on www.SkillZone.ie. Email “Dublin star Michael Darragh Macauley on fitness, basketball and 'bench pressing houses'”. Feedback on “Dublin star Michael Darragh Macauley on fitness, basketball and 'bench pressing houses'”.